Evolution of salamander life cycles: a major-effect quantitative trait locus contributes to discrete and continuous variation for metamorphic timing. Title Evolution of salamander life cycles: a major-effect quantitative trait locus contributes to discrete and continuous variation for metamorphic timing. The evolution of alternate modes of development may occur through genetic changes in metamorphic timing. This hypothesis was examined by crossing salamanders that express alternate developmental modes: metamorphosis vs. paedomorphosis. 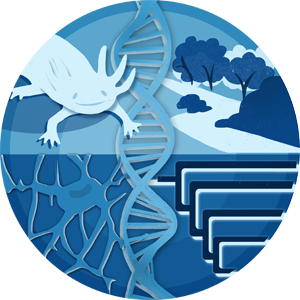 Three strains were used in the crossing design: Ambystoma tigrinum tigrinum (Att; metamorph), wild-caught A. mexicanum (Am; paedomorph), and laboratory Am (paedomorph). Att/Am hybrids were created for each Am strain and then backcrossed to their respective Am line. Previous studies have shown that a dominant allele from Att (met(Att)) and a recessive allele from lab Am (met(lab)) results in metamorphosis in Att/Am hybrids, and met(Att)/met(lab) and met(lab)/met(lab) backcross genotypes are strongly associated with metamorphosis and paedomorphosis, respectively. We typed a molecular marker (contig325) linked to met and found that met(Att)/met(lab) and met(Att)/met(wild) were associated with metamorphosis in 99% of the cases examined. However, the frequency of paedomorphosis was 4.5 times higher for met(lab)/met(lab) than for met(wild)/met(wild). We also found that met(Att)/met(wild) and met(wild)/met(wild) genotypes discriminated distributions of early and late metamorphosing individuals. Two forms of phenotypic variation are contributed by met: continuous variation of metamorphic age and expression of discrete, alternate morphs. We suggest that the evolution of paedomorphosis is associated with genetic changes that delay metamorphic timing in biphasic life cycles.